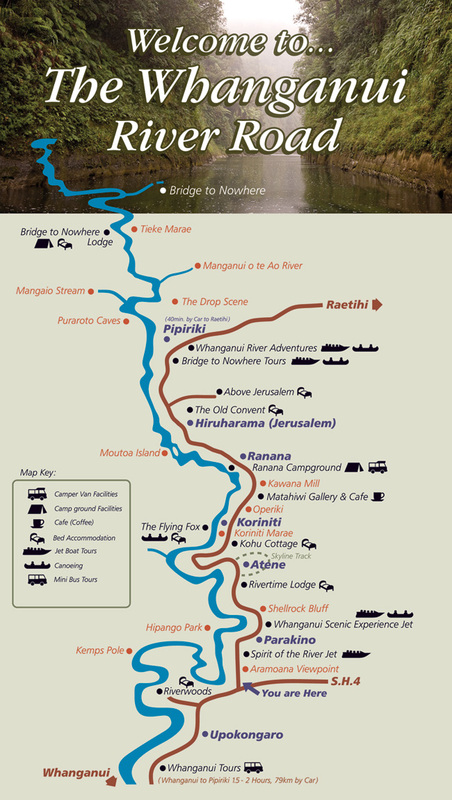 The Whanganui River and Whanganui River Road are two inter-related journeys.The road which follows the lower reaches of the river from Pipriki to Wanganui is the only scenic driving route alongside a river in New Zealand, with such richness of both cultural and natural heritage. The 79 km road leads to the Whanganui National Park, is intimate and adventurous and enables travellers to visit isolated communities and a pace of life which is in contrast to the rest of the country.Approximately half of its length remains unsealed, which requires a slower driving speed than usual. A mail coach trip, available Mon – Fri, is a popular way of visiting the area, enabling visitors to travel in comfort while hearing the many stories of this historic area. There are stunning views of the river along much of the roads length, with many opportunities for picnic stops. Of particular interest are the many beautifully preserved Marae ,which are the family gathering places of local Maori,which are usually visible from the road. Visitors are welcome, although permission must always be obtained before entering. The village of Jerusalem (Hiruharama) which was once part of a larger village called Patiarero, has been home to two famous figures from New Zealand history, Mother Mary Aubert, whose Catholic mission remains today, and highly recognised New Zealand poet James K Baxter, who established a retreat and commune in Jerusalem in the late 1960s. Pipiriki, 79 kilometres from Wanganui, is a gateway to the Whanganui National Park. A Department of Conservation information centre and a museum is located in the historic Colonial House, and there is a shelter and toilets for travellers provided. There is a range of accommodation options available along the River Road including home and farmstays, selfcontained cottages, woolshed stays, and camping and campervan facilities. These usually need to be booked ahead, as most are combined with the daily working life of locals.Some have remote access by aerial cableway or by boat.which needs to be arranged in advance.A rivertaxi service is available to provide an alternative means of access to some of the more remote options.